A retired Marine lieutenant colonel who was fired from her job commanding the Corps’ only female recruit training battalion has released a 304-page book outlining deep problems she saw in how the service handles recruiting and training women. Nearly three years later some of the methods she used to remarkable success in both challenging and improving female recruit training have been formally implemented. That’s proven to be a partial vindication, she said, but much more needs to be done for the Corps to move forward. To date only one woman has graduated the course. Kate Germano was fired from her post at Parris Island, South Carolina, in June 2015 for allegations that she led a “hostile, unprofessional and abusive” command at 4th Recruit Training Battalion. Throughout her book “Fight Like a Girl” and in recent interviews, Germano has defended her leadership. She said she was holding officers and enlisted Marines accountable to set a higher standard for female recruits, a standard many women met in larger numbers for perhaps the first time in female recruit training. But she claims that ingrained biases of both male and female commanders and enlisted Marines along with the simultaneous Marine Corps review of integrating women into combat roles coupled to force her from the position. Germano later retired after 20 years of service. When asked for responses regarding specific named officers and incidents detailed in Germano’s book, Capt. Joshua Pena, spokesman for the Marine Corps’ Training and Education Command, which oversees recruit training, told Marine Corps Times it would be inappropriate for the current commanders to comment on past commanders. 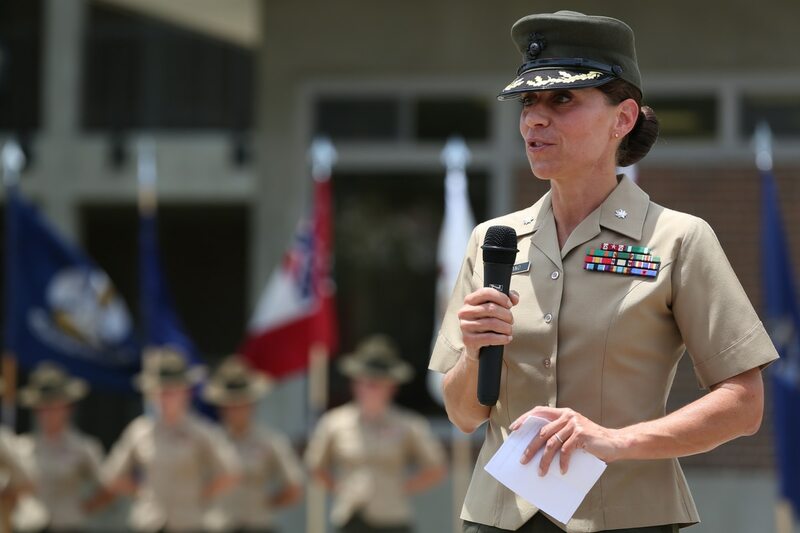 What she saw as gender bias at many levels of Marine Corps leadership came from individuals with conservative ideas on the role of women in the military but was also baked into the culture, she said. “When you compare the Marine Corps to the Army there is a marked difference between not only training but the ­marketing,” Germano said. She noted that the Army and the other branches have goals for how many ­female recruits they bring into the service each year and plans to increase those numbers in the future. The Marine Corps began direct mailing to potential female recruits in 2014. Nearly a third of the mailings now target female high school graduates. Marine Corps Commandant Gen. Robert Neller said in January he wants to grow the percentage of women in the ranks from 8 percent to 10 percent this year. But that has been, what Germano calls, a “chicken or the egg” scenario, because there is limited capacity to house and train more female recruits. Parris Island has only some 3,500 slots annually for them. Pena said that Parris Island has the capacity to train the current number of female recruits entering the force, and officials have publicly stated that if those numbers rise they will consider ­opening the San Diego boot camp to female ­Marines. 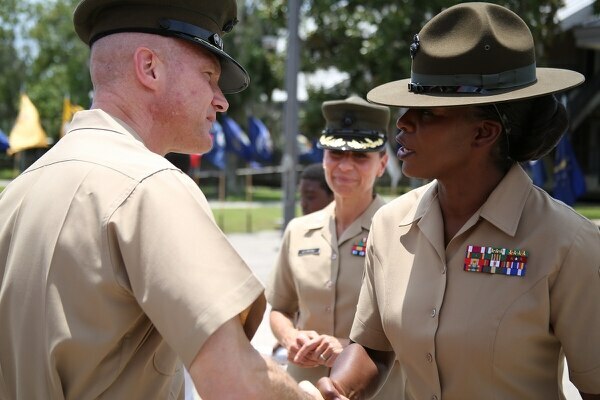 Some female drill instructors train male recruits at San Diego, giving them an initial exposure to a female commander that historically was not the case. Germano co-authored the book with journalist Kelly Kennedy, an Army veteran and former Army Times reporter. Kennedy said what stuck out to her most interviewing Germano was an incident in which a female sergeant told Germano she didn’t feel she could tell her chain of command about a male Marine who was sexually harassing her. Kennedy looked back on her own service, noting that she too wouldn’t have thought to speak up about those problems because, at the time, it simply wasn’t part of the culture to speak out. “I think any young woman thinking about entering the military should read it. If she can’t get a mentor, at least she’ll know what she’s going to face,” she said. Germano sees change happening on a few fronts. First it will have to come from existing female and male commanders in the lower and mid-level ranks. “It’s going to take a radical paradigm shift at high leadership levels,” Germano said. She’s not very confident that will happen until current leaders cycle out of the ranks. “I think the captains get it,” ­Germano said. But it will be awhile before leaders gain the seniority to make real ­policy-level changes, she said. In her book she specifically named former commandant, now Chairman of the Joint Chiefs of Staff, Gen. Joseph Dunford, as opposing female integration into ground combat units. Dunford’s spokesman, Air Force Col. Patrick Ryder, did not respond to ­messages seeking comment. Germano gave Neller a B-plus grade for his concern about integrating females into training and ground combat roles but for implementation gave him a C or D.
If commanders put sexual harassment statistics on officer fitness reports and held them accountable for dealing with those numbers, she said, sexual harassment incidents would become a priority. A recent Marine Corps Times article examined the number of women in combat billets since the Department of Defense ordered the Corps to open those jobs to women. In March, there were 92 women serving in traditional combat billets and only 11 were in the infantry. Many of the changes from recruiting to boot camp training, such as having male and female recruits march together on hikes, have been changed in practice but not in policy, which means any new commandant or local commander could revert to segregated training or deprioritizing female recruiting at any time. And it’s happened before. Some training events were integrated in the 1990s but that changed back to segregated boot camp in the early 2000s, Germano said. Maintaining and advancing cultural changes in the ranks will take persistence. And, Germano said, it starts with leaders.